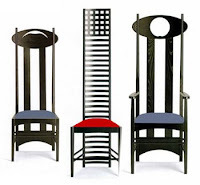 Charles Ronnie Mackintosh was a member of the Arts and Crafts Movement. He had a poor upbringing, he attended Glasgow School of Art for the drawing tuition he needed to complete his training as architect’s apprentice. He believed architects needed greater artistic freedom and with this in mind he explored decorative forms ,designing furniture, metalwork and graphic arts .In 1896 he was asked to design a new building for the School of Art in Glasgow, this became his masterpiece. On completion of the library in 1909 he looked to Japanese tradition for inspiration.